A new collaboration agreement has been announced today by Macquarie University and clinical-stage regenerative medicine company Regeneus Ltd (ASX: RGS), to commercialise a breakthrough cell selection technology that for the first time allows high potency secreting stem cells to be identified and selected for the manufacture of next generation cell therapies. 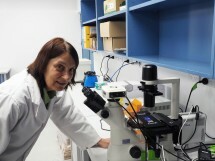 The technology was developed in a research group led by Professor Ewa Goldys and Dr Guozhen Liu at the Australian Research Council’s Centre of Excellence for Nanoscale BioPhotonics (CNBP) at Macquarie, and uses innovative cell labelling technologies to identify and select cells based on the molecules that they are secreting rather than their surface characteristics used currently. Cells secrete various molecules such as cytokines and growth factors that reflect their function and drive therapeutic effects. Professor Goldys, Deputy Director of the CNBP, explained: “Cells can secrete pro-inflammatory cytokines, as part of the body’s sickness response mechanism or anti-inflammatory cytokines that play a role in healing. We can regard anti-inflammatory cytokines as, in a sense, cancelling out the effects of pro-inflammatory cytokines. Regeneus and Macquarie have entered into a collaboration and licence agreement under which Regeneus will provide funding for the further collaborative development of the technology and its applications at the CNBP. Regeneus will also use the CNBP technology to develop the next generation of designer cell therapeutic products where the donor cells have been carefully selected for their particular cytokine profile that have been matched to the disease. The Australian Research Council’s Centre of Excellence for Nanoscale BioPhotonics brings together leading physicists, chemists and biologists from across Australia and the world with research nodes at Macquarie University, University of Adelaide and RMIT University. The Centre seeks to extend the boundaries of knowledge in nanoscale photonics and in the science of surfaces that will power new ways of understanding cellular processes within the human body. For more details visit www.cnbp.org.au. Regeneus Ltd (ASX: RGS) is a clinical-stage regenerative medicine company developing a portfolio of cell-based therapies to address significant unmet medical needs in the human and veterinary health markets with a focus on osteoarthritis and other musculoskeletal disorders, oncology and dermatology diseases. The company has two product candidates in Phase I trials: Progenza is an allogeneic “off-the-shelf” adipose stem cell therapy to treat osteoarthritis and other musculoskeletal conditions and RGSH4K is an autologous therapeutic cancer vaccine to treat a wide range of cancer types. The company is developing a stem cell secretions based cream targeting acne and other inflammatory skin conditions. The company has two therapies targeting animal conditions: CryoShot is a clinical-stage allogeneic off-the-shelf adipose stem cell therapy for the treatment of canine and equine osteoarthritis and other musculoskeletal conditions and Kvax is an autologous therapeutic cancer vaccine in clinical trials.